The Official Results as listed in several sources, including the Middlebury Mercury (Middlebury, VT), January 19 and the The Green Mountain Patriot (Peacham, VT), January 19, are 801 votes for William Chamberlain and 568 for Nathaniel Niles. The county totals, however, add up to 891 votes for Chamberlain and 679 votes for Niles. In the Northeast District, the votes of a number of towns were not reported in time to be counted. 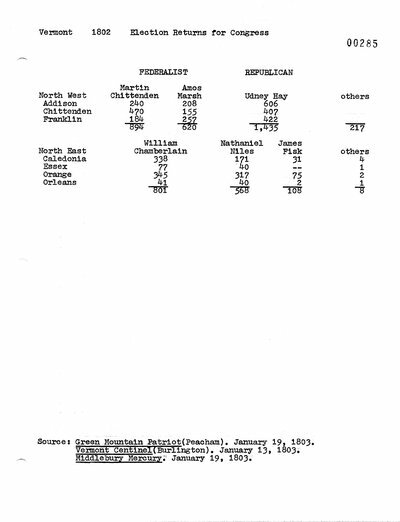 The Green Mountain Patriot (Peacham, VT), January 19, and the National Intelligencer, February 18, report 338 votes for William Chamberlain and 171 for Nathanile Niles in Caledonia County. The Green Mountain Patriot (Peacham, VT), December 29, reports 7 votes for William Chamberlain and 13 for Nathaniel Niles in Burke. The Green Mountain Patriot (Peacham, VT), December 29, reports 17 votes for William Chamberlain in Hardwick. Newbury Town Records do not list any votes for Nathaniel Niles. The Green Mountain Patriot (Peacham, VT), January 19, and the National Intelligencer, February 18, report 41 votes for William Chamberlain and 40 for Nathaniel Niles in Orleans County. The town totals were not counted in the canvas of votes. "Vote for William Chamberlain, Esq. for Representative...in the Congress," individual vote counts not included in the listing. Duncansborough Town Records. The Green Mountain Patriot (Peacham, VT). December 15, 1802. Spooner's Vermont Journal (Windsor, VT). December 21, 1802. The Green Mountain Patriot (Peacham, VT). December 22, 1802. Spooner's Vermont Journal (Windsor, VT). December 28, 1802. The Green Mountain Patriot (Peacham, VT). December 29, 1802. Vermont Centinel (Burlington, VT). January 13, 1803. The Rutland Herald (Rutland, VT). January 15, 1803. Federal Galaxy (Brattleboro, VT). January 17, 1803. The Green Mountain Patriot (Peacham, VT). January 19, 1803. Middlebury Mercury (Middlebury, VT). January 19, 1803. Vermont Centinel (Burlington, VT). January 27, 1803. The Rutland Herald (Rutland, VT). January 29, 1803. National Intelligencer and Washington Advertiser (Washington, DC). February 18, 1803.